Where I grew up in Australia, there really wasn’t any concept of street art other than a little bit of graffiti (mostly just wannabe tagging) under the small sidewalk bridges I took to get to school. My town was what you would call small by American standards (population approx. 2000), although it was the largest town in the area. Kids from three of the smaller surrounding towns were bused to my school to make up my graduating class of 60 students. I loved art but didn’t really know much other than what I could look up in the local library, and it was a 17-hour drive to the main city of Perth. Luckily, I escaped and got to travel the world, but my first memorable introduction to street artists was in Sydney. A cell phone company invited several international artists to paint murals around the Surry Hills area where I lived at the time, and I got to hang with the artists as they painted my neighborhood. This is where I met the amazing OSGEMEOS, who are identical twin brothers Otavio and Gustavo Pandolfo from São Paulo, Brazil, and also WK (aka WK Interact), a French artist based in New York City. Unfortunately, most of the walls were painted over after the event…only a few where allowed to remain. I later moved to New York City and immediately looked up WK; he had a small studio in the Lower East Side. He was very prevalent throughout the West Village and Soho, and I loved when I spotted his work. It is very distinctive. Back then, in 2003, he was just starting to get recognized and was working with some advertising agencies and being commissioned to do large murals. Slowly over the years, I have seen more OSGEMEOS pieces popping up in the East Village as well. New York City is an amazing canvas, and there are so many walls displaying all kinds of themes, from marriage proposals (these can be commissioned) to “in memoriam” murals painted to remember those who have died tragically in the neighborhood. 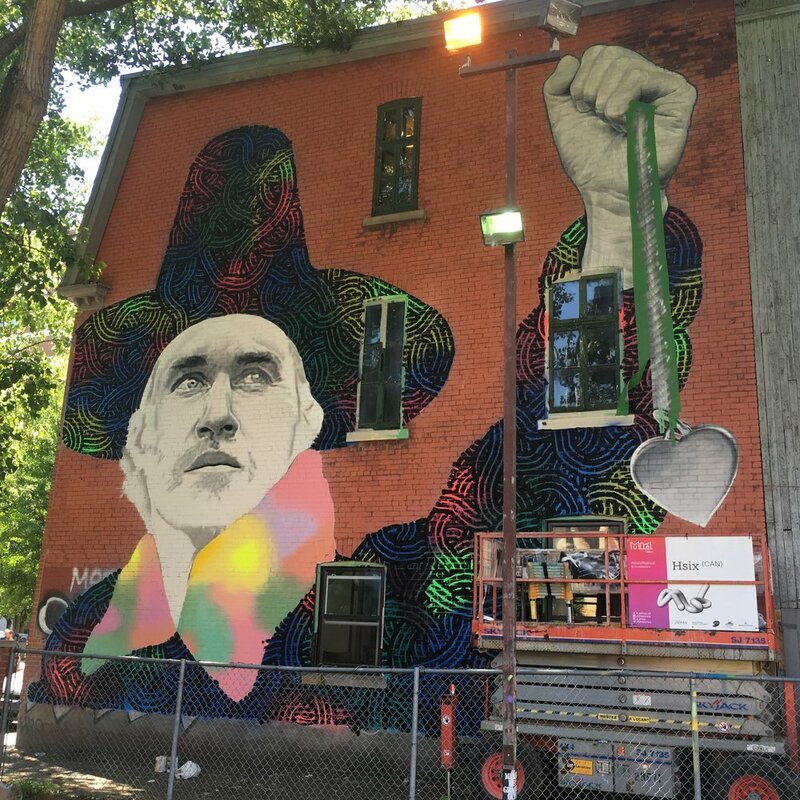 Then I discovered the Montréal Mural Festival, an event spread over 11 days celebrating the international urban art movement. The Festival is in its 6th year now, and every year it gets better and better as the Festival’s footprint expands. The Boulevard Saint-Laurent is transformed into an open-air museum where local and international artists work throughout the Festival to complete their murals. The Festival presents live art, music, exhibitions, and artist talks from a truly global artistic community. There is a map you can follow to view the previous years’ art as well as to preview the new art being created. Check out an interactive version of the map with a curated list of all the artists that have participated there. 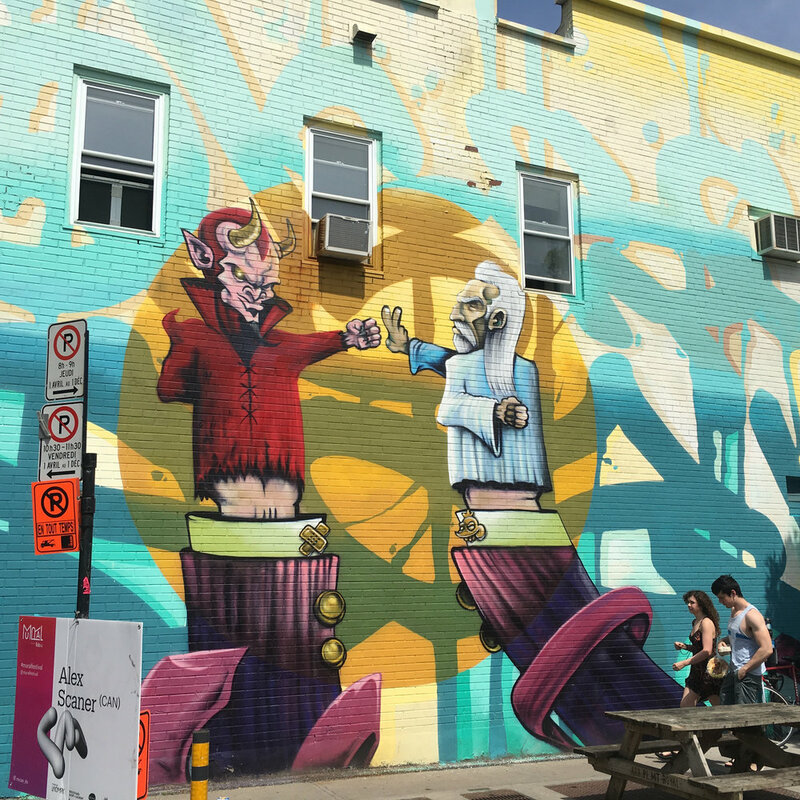 Even if you only want to sample the poutine and a cold Molson, I recommend you also take to the streets and soak in all the amazing art being created right before your eyes. The Festival runs from June 6th to the 16th this year. If you want to stay closer to home, you can check out some of OSGEMEOS’s work on West 14th Street, between 6th and 7th Avenues, or see it online. To see WK’s work in Brooklyn, click here for the map.